Whatever your legal issue may be, we focus on you. Our firm believes that it is vital to our clients' success that all consultations are with a lawyer. In addition, we strive to keep open lines of communication with you, and Mr. Stewart is available off hours, by request, to accommodate your schedule. Above all, we are dedicated to client service. We are also dedicated to the community. 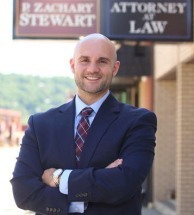 In addition to his law practice, Mr. Stewart is a board member of Family Connections Inc., a local non-profit organization. Family Connections, based in Weirton, West Virginia, is a mental health agency that also operates a group home for teenage girls whose parental rights are terminated and have no other housing options. Call us now for help if you've been charged with a misdemeanor or felony, if you need help with a difficult divorce or if you'd like someone to help you plan for your family's future. Contact the Law Office of P. Zachary Stewart online or by phone at 304-914-3577. At our firm, all initial consultations are free and we accept credit cards.